Since the summer of 1999, four professional musicians who enjoyed playing music together and who knew and believed in the importance of audience involvement and entertainment started the Luvshak band. 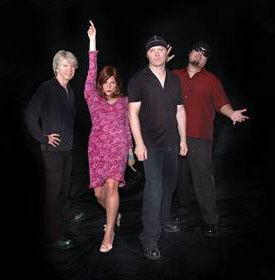 Camille Miller (guitar and vocals), Nick Haggar (bass and vocals) and Clayton Hill (drums and vocals) were joined in 2000 by Darren Harry (guitar and vocals). All members have extensive live and studio playing experience. Luvshak has performed in every circumstance imaginable, from small pubs to large arenas; private corporate functions to full blown Legends of Rock and Roll shows (with various impersonators). These events have brought Luvshak to audiences all over Western Canada to the Middle East, China and Poland. luvshak is known for its versatility and its ability to connect with, hold, and entertain an audience like no other club band on the circuit today. Noteable Entertainment & Events is a Vancouver based booking agency, party rental, entertainment services and event production company. If you are interested in booking Luv Shak please contact us.